Comet 205331A - D/S W/BSH, 10 Tooth. 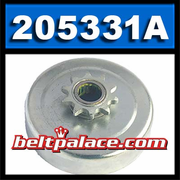 Home > Comet Clutches and Parts > Comet 206169A automatic centrifugal clutch. Comet Industries 206169-A. SCS 400 Series Drive Clutch. > Comet 203963A, LA 400 Series Chain Clutch. 11 Tooth > Comet 206170A, Comet SCS 400 Series. 10 Tooth. > Comet 205331A - D/S W/BSH, 10 Tooth. Comet 205331A, SC-400 Series Drum and Sprocket with Bushing. 209170A Replacement Drum/Sprocket Assembly (with 205279A Bearing installed). 10 Tooth Sprocket, Uses 40/41 Chain, 3/4" I.D., 4.25" Overall Diameter. Comet Part description: 205331A - D/S W/BSH 10T. Genuine Comet Industries item Made in USA.